Background: RNA is increasingly recognized as a powerful molecule that can be used to control gene expression. Sophisticated, well-engineered RNA-based regulators are being developed as oligotherapeutics. Methods: In particular, small activating RNAs (saRNAs) are promising therapeutic options for targeting human diseases. Numerous saRNAs targeting multiple cancers have been developed in preclinical models. One saRNA targeting C/EBPα is currently undergoing clinical trials in liver cancer. 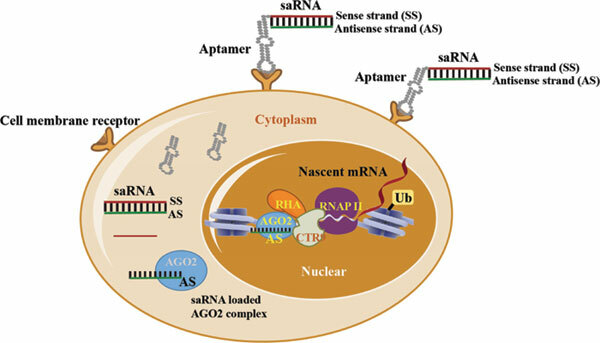 Results and Conclusion: In this review, we describe the current working model of the intracellular mechanism of saRNA, discuss the recent progress of saRNA therapeutics in preclinical and clinical trials, and current advances in targeted delivery using aptamers in detail. saRNAs, therapeutics, human cancers, intracellular mechanism, targeted delivery, aptamers, clinic.